Military life can be isolating. Those who have never experienced military life sometimes don’t “get” it… or they think they do, and get it wrong… or they shy away from it because they don’t know what to say or do or don’t want to offend. And so, sometimes, military spouses are left alone. Are you ready for it? Military life changes nothing. Military life will change you friend’s zip code. It might change what he/she experiences. It might make some things harder. It will definitely change your friend’s vocabulary. But it won’t suddenly–abracadabra!–turn your friend into someone different. 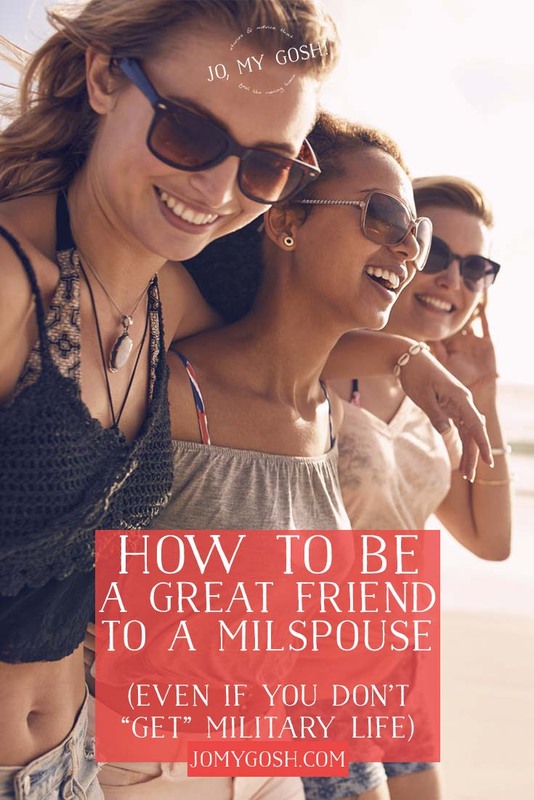 If your friendship has withstood your teenage years, or sloppy, drunk fights during college, or weird boyfriends (or girlfriends) that you couldn’t stand to be around, or insert any number of obstacles–both silly and tough–then there’s no reason that your friendship can’t withstand military life. It’s true–the distance and stress can winnow out some of the meh friends from the great friends–but you’re not a meh friend. After all, you’re reading this… so you care about your friend and your friendship. Unless your friend grew up in the military life, they probably are learning all of this military stuff too. If you’re having a conversation and they mention something about going to the commissary and you have no clue what they’re talking about, just ask. (It’s the grocery store on base, by the way.) Most military folks don’t expect you to know all of the ins and outs of the lingo– in fact, sometimes it varies from branch to branch and even region to region– and are happy to explain it. (And if they’re not, they’re jerks.) Understanding what your friend is talking about will help you gain a little bit of insight into their life. Sometimes distance does not make the heart grow fonder. Sometimes it just makes it more distant. If your friend is far away, make a concerted effort to keep them in the loop. Most likely, they are overwhelmed by how many people they feel like they need to keep in contact with. Help your friend out– spend time emailing them first or giving them a ring. Be intentional about staying in contact, especially during the early months of their move when they might feel especially lonely or depressed. Military spouses often find themselves being at the exhausted end of what can feel like a one-way street. Between kids and a spouse who is deployed or often absent, it can feel like you’re always giving to and taking care of others… but often no one seems like they’re taking care of you. A small gesture like a postcard or a handwritten note can mean a world of difference–especially if your friend has just moved and might not be receiving any “fun” mail (boo, bills). If you know your friend’s spouse is deploying and you are able, plan some time to visit your friend. Send care packages, emails, pictures… what you can do is endless. Have a friend in mind that you want to treat? Troopster Care Packs–a care package company run by a current active duty sailor (who is also a milso!). (Or if you need a little TLC, you can send it to yourself, too.) This isn’t a sponsored post– I just love Troopster, their product (their boxes are jam-packed and awesome), and their mission. Seriously. Check them out. They’re awesome! 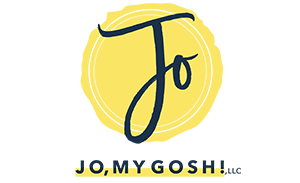 Use JOMG18 to get 20% off all Troopster Care Packs purchases! ove all the rescources that’s jo provides!! I keep in touch with friends and family via email mostly.. Honestly, through facebook is how I keep in contact with friends; I have friends around the world doing their lives.